Researchers: Makan A. Karegar and Timothy H. Dixon, University of South Florida and Simon E. Engelhardt, University of Rhode Island. 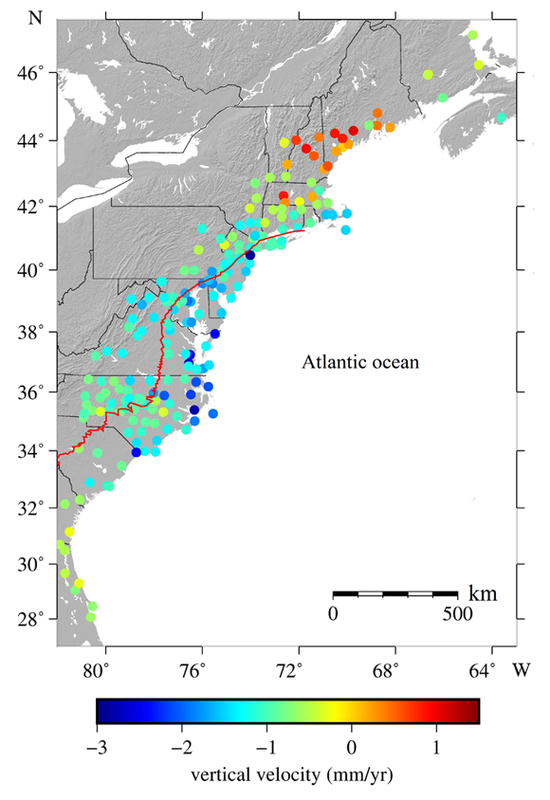 Long-term records from GPS stations along the Atlantic Coast of North America show long term subsidence due to geologic adjustments and short term subsidence due to human-related groundwater extraction. 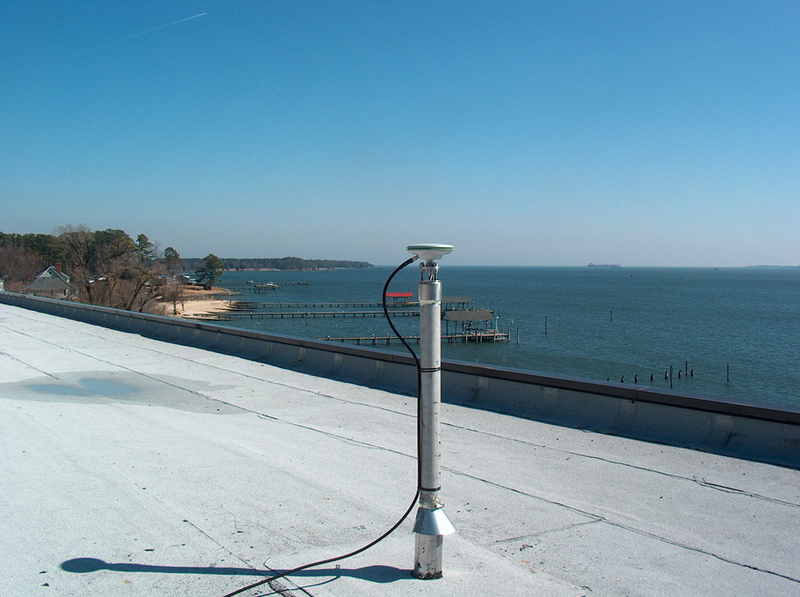 These measurements are critical for understanding water use, sediment structure and sea level rise. In particular, knowing the rate of subsidence or uplift along this populated coastal plain could help mitigate flooding and inform land use. There are more than 215 GPS stations in eastern coastal North America that have been recording any horizontal or vertical land surface changes on a continuous basis for between 4 to 18 years with at least 70 stations recording continuous observations for more than 10 years. These exquisite and detailed observations allow geoscientists to consider the many processes affecting the rise or fall of the surface at any given site. The GPS stations are maintained by the UNAVCO Plate Boundary Observatory, NOAA CORS, International GNSS Service, and Maine Technical Source. The processes include glacial isostatic adjustment (GIA) since the end of the Last Glacial Maximum (LGM) about 20,000 years ago, sediment loading, compaction, and topographic relaxation related to the erosion of the Appalachians and other geologic processes related to mantle structure or far-field plate tectonics. GIA is considered to be the major source of vertical coastal changes; the surface is rising where the Laurentide Ice Sheet has been removed, while the surface is falling where the forebulge around the edge of the ice sheet is collapsing. Sediment compaction is considered a secondary source and the others are more minor sources of vertical changes. The authors compared geologic rates of relative sea level from 4,000 years before the present to 1900 that describe vertical surface motion with GPS measurements of present-day vertical surface motion. The comparison shows subsidence due to GIA controlling most of the vertical motions along the coast. Along the central Atlantic coast (Virginia and the Carolinas) the GPS shows rapid subsidence that is consistent with recent groundwater extraction (based on well water data). The GPS observations are critical for understanding coastal surface motions related to geologic processes and human influence as well as for differentiating sea level rise due to geologic processes versus climate change and/or oceanic processes. The data will help inform coastal flooding mitigation and water resource management along the populated Atlantic Coast. 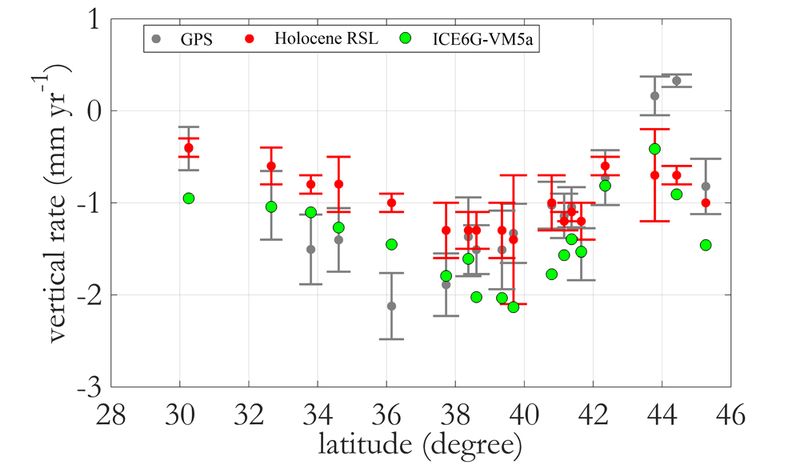 Karegar, M. A., T. H. Dixon, and S. E. Engelhart (2016), Subsidence along the Atlantic Coast of North America: Insights from GPS and late Holocene relative sea level data, Geophys. Res. Lett., 43, 3126–3133, doi:10.1002/2016GL068015.